NEW HAVEN, Conn. — Just two days after a Cambridge, Mass. march and rally in support of 750 striking Unite Here Local 26 Harvard University dining hall workers, the University agreed to the contract demands for wage increases to $35,000 a year and to maintain the workers’ current healthcare benefits. 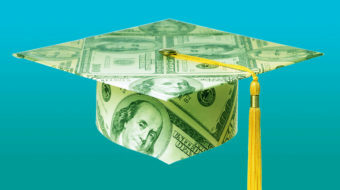 This significant victory for the lowest paid workers at the wealthiest university in the world was won with solidarity from students and faculty on campus, and union workers across New England. It was the first strike at Harvard in 33 years. Connecticut’s Unite Here food service and university workers traveled by bus and car to take part in the march and rally. The Connecticut workers said the experience made them even more committed to winning their own current contract negotiations for a living wage and affordable health care benefits. Food service workers from Southern Connecticut State University (SCSU) were among those to take the trip up to Boston, some with their children and families, to march and rally alongside hundreds of their food service brothers and sisters at Cambridge’s Commons Park. They could relate to the strike demands, because they are in contract negotiations with their employer, Compass Group U.S.A.
SCSU dining hall shop steward George Sanchez brought his second oldest son with him, “to show him the power of people coming together peacefully to rally and march for change and worker’s rights. We all want better pay and benefits,” he said. Local 217 members have been rallying, marching and holding job actions at SCSU, Wesleyan University, Fairfield University and the University of Hartford as part of Unite-Here’s October Month of Action, a three-week solidarity with dining hall employees in contract negotiations. Members of Unite Here Locals 34 and 35 at Yale University in New Haven, Connecticut also took a break from their own contract negotiations with the administration at wealthy Yale University to travel to Harvard and support their sisters and brothers on strike. They were joined by Local 33, the graduate workers’ union that has filed a complaint with the NLRB to gain recognition from Yale, and its community affiliate New Haven Rising. 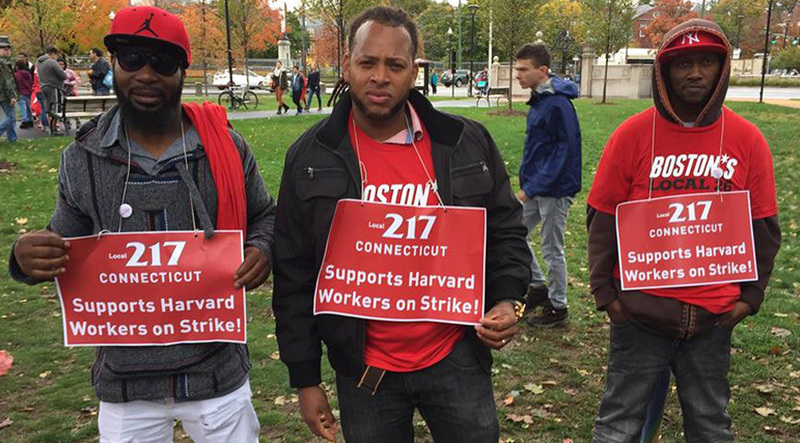 The cost of health care premiums and co-pays, one of the main issue of Harvard’s strike, is also a big issue for Connecticut’s Local 217 members. Increased health care premiums and higher co-pays will be devastating for all dining hall employees and in some cases are a matter of life and death. The arguments Harvard made, that worker’s wages are higher than most food service workers and that health costs have risen steeply, are the same arguments major food service companies and universities are using everywhere to avoid paying livable wages and benefits. For the food service workers this raised a class question: how can workers survive a capitalism that will not pay them wages and benefits they or their families need to live on comfortably? “This march opens our eyes to the fact that we’re all under attack!” John DeCarbo, a University of Hartford employee said. 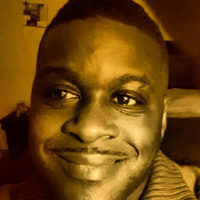 Jahmal Henderson is a union and community organizer in New Haven, Connecticut.